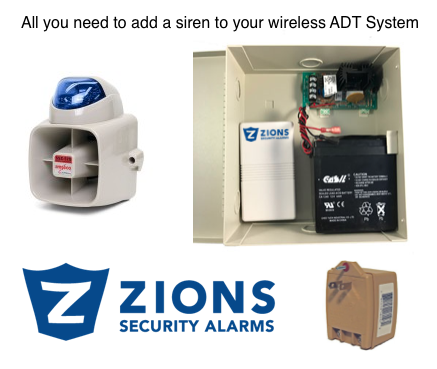 If you are looking for a compatible Siren Kit to your ADT QuickConnect or ADT Pulse TSSC System , you have come to the right place. This kit allows you to save $60-$70 worth of parts if purchased elsewhere! Go here to save more money! Choose the siren that works best for you and your system with the 3 options available. There are two issues that make it difficult to accomplish this. First, the control panel itself doesn’t have enough power to connect a hardwired siren like an ADT Safewatch Pro 3000. Second, there isn’t an wireless outdoor siren that’s compatible with your system (only an indoor wireless siren). This Kit and it’s Variations are available for purchase here. Wireless Relay Module – this communicates with the ADT panel when the alarm goes off. 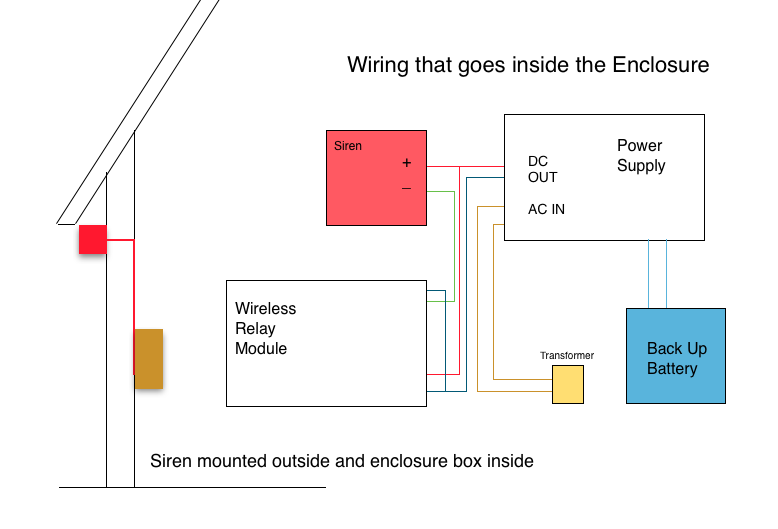 Power Supply, Transformer, and Back-Up Battery – these supply the power for the outdoor siren. Box – This is a nice little box to put everything above inside securely. The Siren will vary based upon the variation you choose. The rest of the parts will remain the same. *Note, you will need to assemble these together yourself. Once you have the above kit, you can attempt to do it yourself or you can schedule a tech phone support call with us to walk you through it or schedule a service call for a technician to come do it all for you. Once installed, the wireless relay module requires programming into the ADT Quickconnect or ADT Total Security Panel. If you have an ADT QuickConnect System and want to run a wire to the enclosure/box, you can replace the Wireless Relay with this Sensitive Relay. The Sensitive Relay is required because the QuickConnect has a current limit of 3mA. A jumper wire is required from TRG+ to the POS+ terminal as well as common ground.